Not your Jewish mother’s brisket. Pittsburgh is quite a unique place. So unique, in fact, that when I arrived I was given a crash course in how to speak Pittsburghese. I’ll spare the details, aside from the fact that Pittsburgh has its own version of “y’all.” That word is “yinz” and people who speak in Pittsburghese are referred to as “Yinzers.” With that in mind, you can now rest easy knowing that the BBQ you are about to read about is a play on “yinz” and not some obscure Civil War battle. And now, onto the BBQ. 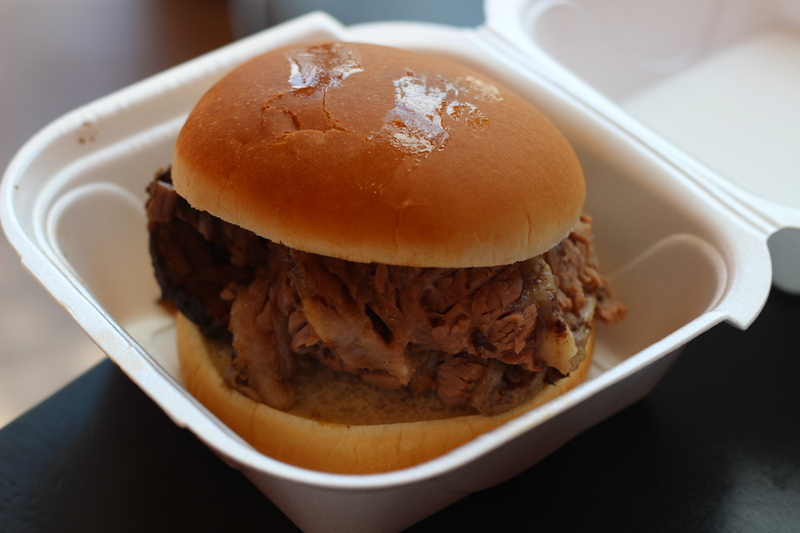 YinzBurgh BBQ sits in a nondescript building in Bloomfield with only two tables for seating and an open kitchen that takes up the vast majority of the space. If it isn’t immediately apparent upon entry that the owner of the place loves his BBQ, it takes very little time to learn, as he is standing behind the counter taking orders. But before that, he makes sure to ask if you have ever been before. 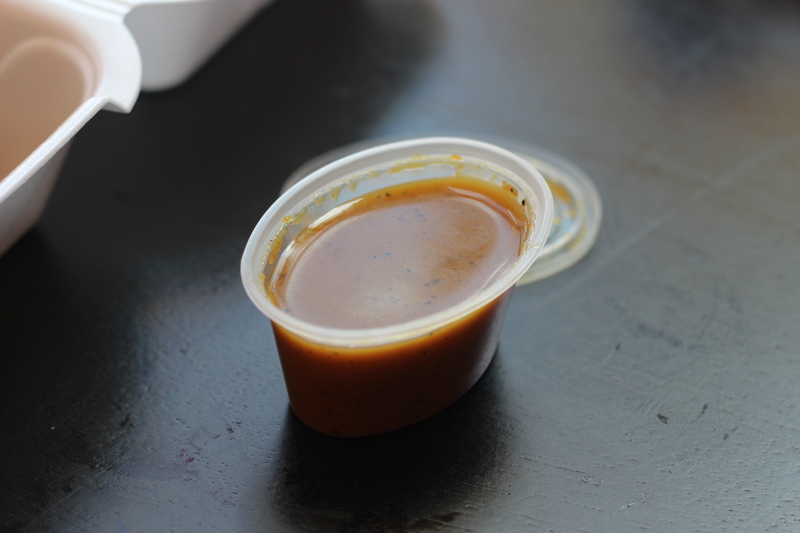 If not he busts out all five of his custom sauces to taste because he feels the sauce is the most essential aspect of ordering. It’s certainly hard to disagree (and I would later learn that I would have been perfectly happy even without sauce). The options are Signature Red (tomato-based available in hot and mild), Honey Gold (mustard-based available in hot and mild) and a Carolina Vinegar as well. After a fantastic conversation about the qualities of each, I chose the Hot Honey. My life needs more of this. I asked what went well with that sauce and was a little upset when he said “everything.” I hoped that the sauce would narrow down the options, but I also figured if he said it went well with everything he would be speaking the truth. So I went with a Brisket Sandwich and a side of Mac and Cheese. The sandwich was every bit as delicious as I had expected from such a place. It had been cooked to such a perfect tenderness that it was almost like butter in my mouth. Certainly, I could have eaten this without a sauce and it would have been enough (dayenu), but the sauce put it over to top in greatness. Not the daddy mac, but still not bad. 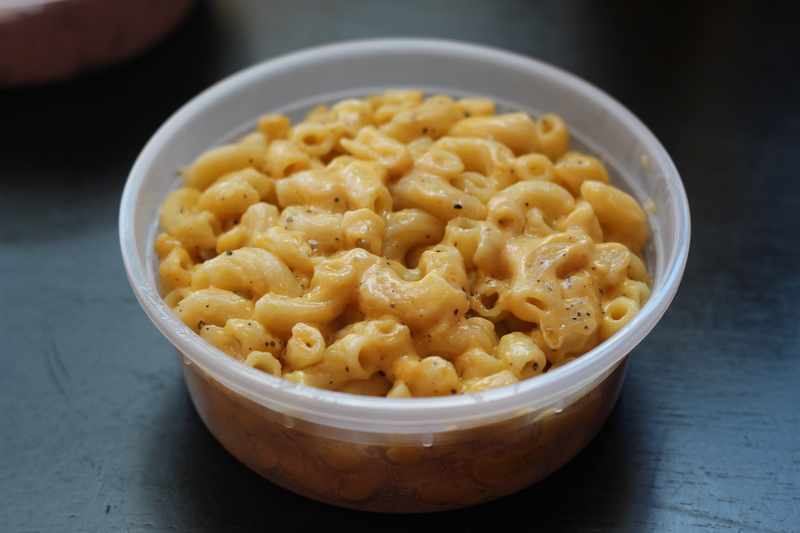 Then there was the mac, which made for a tasty side, but was otherwise pretty typical. It had a nice hint of pepper to it to give it some flavor boost, which was good, but not enough to take it to the same level of greatness of the brisket and sauces. Nonetheless, there was nothing disappointing about the mac and cheese and the brisket really was great. 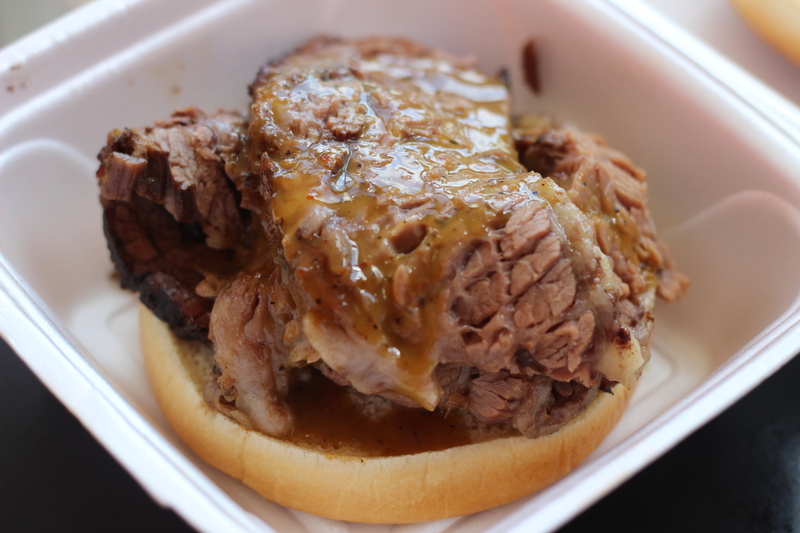 I can’t wait to get back and see what other meaty delights YinzBurgh BBQ has in store for me.